NSPE is troubled to hear of the tragic pedestrian fatality in Arizona—the first fatal crash involving a fully autonomous vehicle. Our deepest condolences go out to the victim’s family and all involved in this incident. 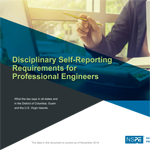 In representing professional engineers and their commitment to upholding the public health, safety, and welfare, NSPE has long advocated for a comprehensive and informed approach to developing and deploying fully autonomous vehicles, and recently released a policy guide with guidelines to measure the safety readiness of these vehicles. Our hope is public policy decision-makers, regulators, manufacturers, and others will heed these guidelines and consider the major safety, technological, and ethical implications at stake to mitigate future accidents.